The following settings are tested with the Casio Exilim Z77, but most other Casio cameras are very similar. I have only mentioned the most important settings respectively those which differ from the factory defaults. If you consider my note about shutter speed later you do not need this automatic ISO setting. The auto focus uses a small spot in the centre of the screen for metering. You can use the left and right key next to the set button to change the ISO sensitivity without having to use the menu. Deactivate quick shutter to avoid blurry images. 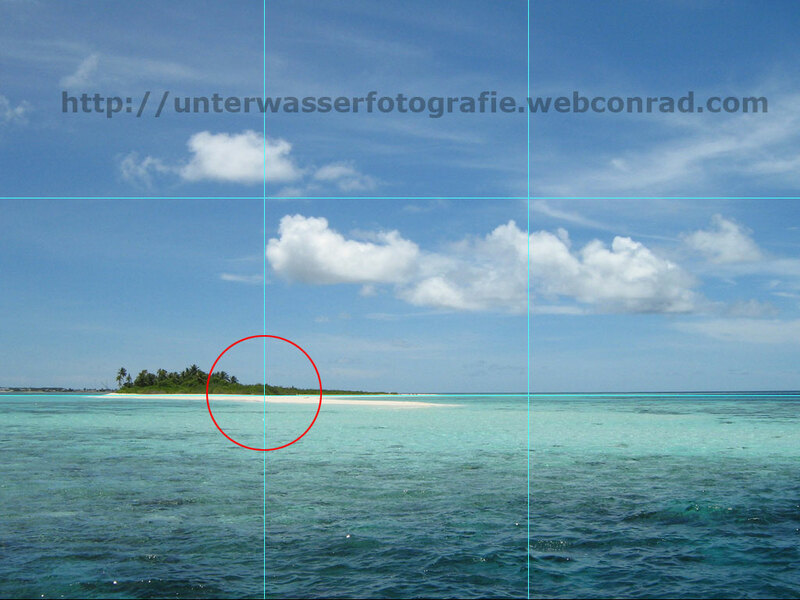 The grid helps you to easily compose your image ("golden ratio", see below). Configure power on default settings. Always take your pictures in full size so that you can crop them afterwards without any quality loss. This setting increases the reds in the picture. Only increase the sensitivity if the picture is too dark and the shutter speed would be too slow (see below). Multi metering provides correct automatic exposure settings for most conditions. File names won't be reset to 0001 if you change memory cards. Don't use "Underwater" Bestshot because it would override all your manual settings (eg. Flash off). The ISO setting specifies the sensor's sensitivity to light. A low sensitivity requires a long exposure (little grain but chance of a blurry image). A high sensitivity requires a short exposure (visible grain but sharp image). You should always use the lowest possible ISO sensitivity which allows taking a sharp image. Especially for night shots you should have a tripod so that you can use ISO 50 or 100 with a long exposure. Having the main subject in the middle of the picture is boring. Images appear more interesting if you stick to the "golden ratio". Divide the image into three parts (horizontally and vertically) and you'll get four intersections. Place the main subject in either of them. You will almost always use the auto focus due to its large focus range. Half-press the shutter button and wait for the green rectangle to display on the screen. In difficult light conditions (eg. underwater) it might be red and you would get a blurry image. In this case switch to the fixed focus "pan focus". You do not need to worry about all other modes as they are dispensable. Always keep close to the subject (15 cm - 2 m) and don't zoom in (to avoid blurry pictures). Half-press the shutter button and wait for the shutter speed to display on the screen. If it's shorter or equal than what is stated above (higher denominator) take the picture! If the shutter speed is higher increase the ISO sensitivity and try again. 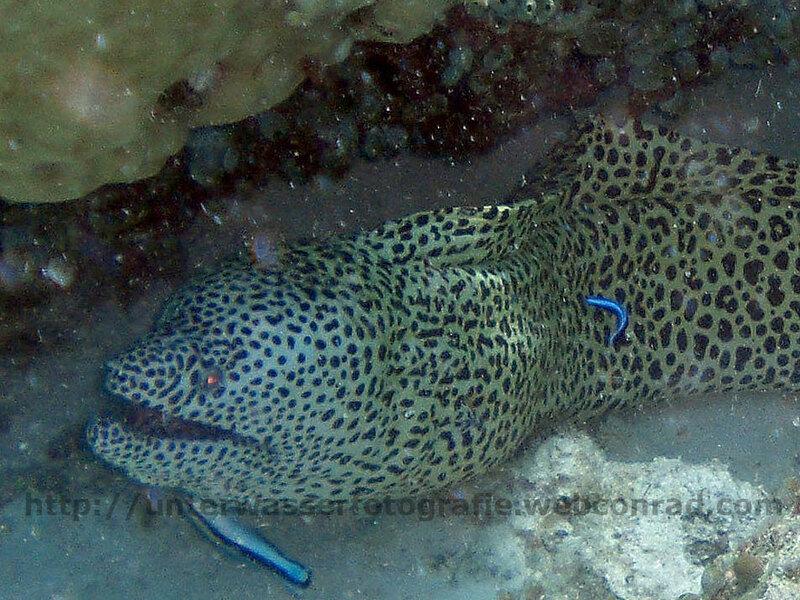 The built-in flash only has a range of about 1 m underwater (external flash can hardly extend this range due to physical limitations underwater). It usually illuminates floating particles in the water and they show up as bright dots (backscatter) in the picture. Only use flash if you are close to the subject and the water is very clear. Take your time and don't chase your subject. Shoot upward to emphasise the fish's size. Shots from behind the fish rarely look interesting. Isolate the subject in front of open water to emphasise it. As snorkeller don't take all pictures from the surface, descend from time to time! It is very difficult to take the perfect picture of a fast moving subject. Select the continuous shutter mode (Menu > REC > Continuous: Normal Speed) and press the shutter button. Images will be taken until you release the button. Hold the camera with both hands and hold your breath while pressing the shutter button (to avoid blurry pictures). Drift in the water and restrict your movements. Apply a slight amount of silicone grease to the o-ring and pull it through your fingers. You don't have to regrease it every day, but ensure that the o-ring does not dry out. There should never be any dirt, hair, sand or other impurities on the o-ring or in the groove. Check the opposite side of the case (the part which has contact to the o-ring when you close the case) as well. 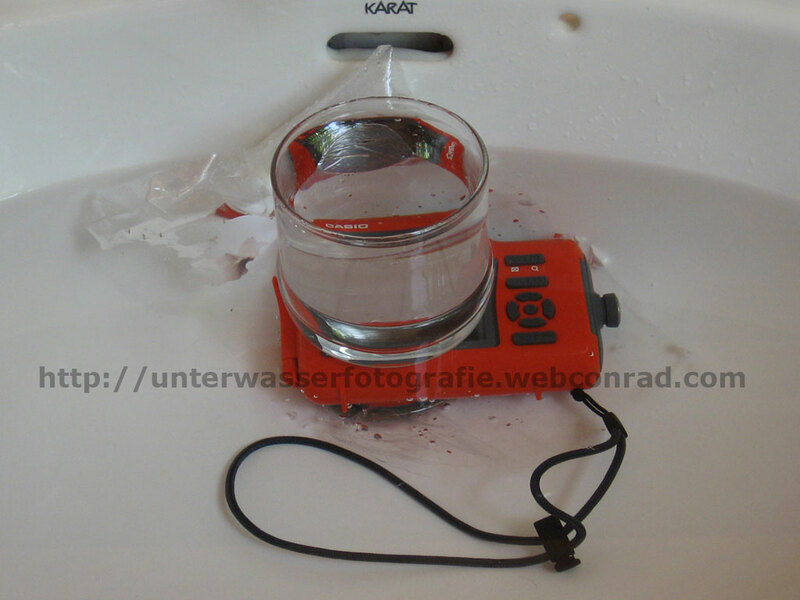 Close the case without the camera inside and submerge it in water (as shown in the picture). Wait for three minutes, dry the case with a towel and check if no water got inside. 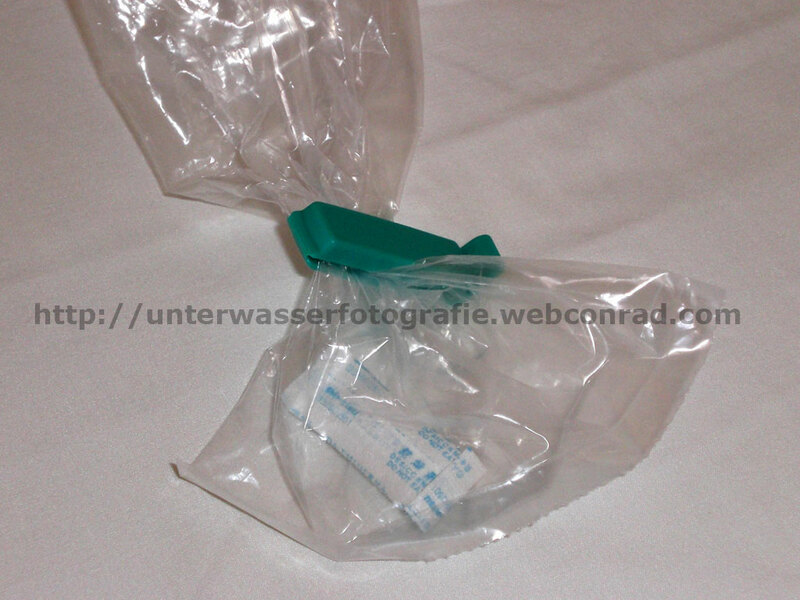 Place one silica-gel packet into the holder before putting the camera into the case. If you don't have the chance to clean the case properly (eg. on a boat trip) wrap cloth soaked with freshwater round the case. You have to keep it wet at all times to avoid the formation of salt crystals. Take a bottle of freshwater along to rinse the case after each dive. Don't open the case in between (particularly not on the beach!). 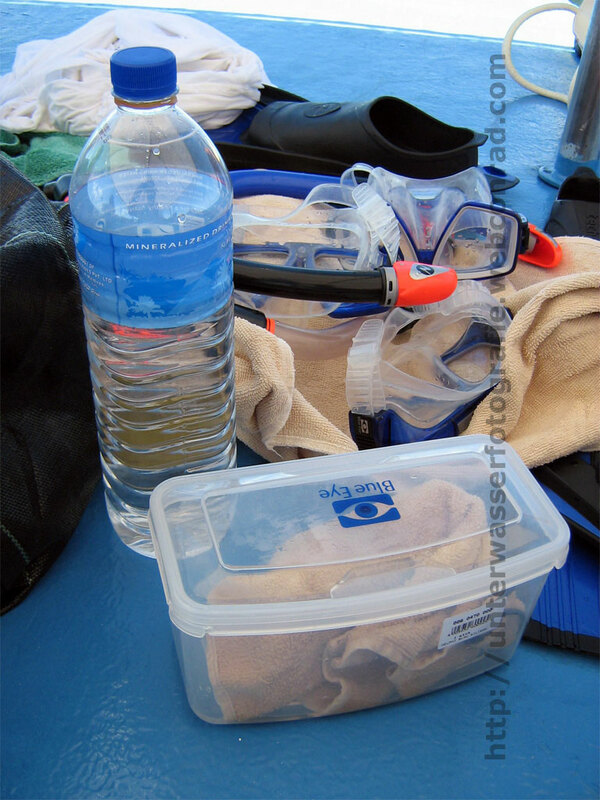 The proper cleaning after each dive is very important: Submerge the case in water and wait for at least 30 minutes. Before you take it out press all buttons several times to remove any salt or dirt. Dry the case with a towel and take out the camera. Take out the o-ring and inspect for any impurities or even damages. Wipe the groove with a lint-free cloth and regrease the o-ring if necessary. In the unlikely case of water penetration take the case out of the water immediately, dry it with a towel, take out the camera and remove battery and memory card. Never switch on the camera to check if it's still working at this point in time! Wait for at least 48 hours to see if you can rescue the camera and pictures. Never leave the case in areas subjected to direct sunlight and don't touch it with oily (sun creme) fingers. Store silica-gel packets in plastic bags so that they can't absorb moisture from the air. You can use each packet for two or three dives. Don't throw them away afterwards: place them in an oven at 80° C (176° F) for at least half an hour and they will be as good as new. Leave the case ajar so that the o-ring doesn't deform under pressure. Take out the o-ring and wipe it with a lint-free cloth. Grease the o-ring a little bit more than usual and place it back into the groove. Leave the case open and store it in a dry, shady place.